Benghazi whistle-blower Gregory Hicks: Special Forces missed flight to besieged embassy. 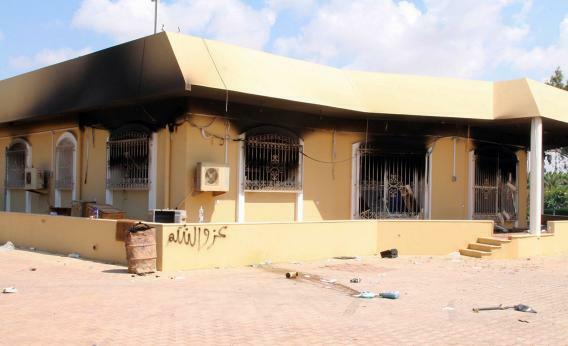 A burnt building is seen inside the U.S. Embassy compound on September 12, 2012 in Benghazi, Libya, following an overnight attack on the building. Because I wrote about the Benghazi investigations over last year, and because my last piece on it was subtitled, “The final report on the attack on the U.S. consulate makes one thing clear: Republican charges of a cover-up are pure fiction,” conservatives are diligently emailing and tweeting me to inform that I’m a shill for the Obama administration. Reading past headlines and subheds can be time-consuming, I know, but here was the nut graf explaining which theories were being debated or debunked. The “stand down” theory originated in an October 26 Fox News EXCLUSIVE (capital letters in the original), which reported that the CIA “chain of command” had “told the CIA operators twice to ‘stand down’ rather than help” besieged Americans. A complementary theory, advanced by the father of the murdered Navy SEAL Tyrone Woods, suggested that the White House had a “live feed” of the attack and sat shiva, doing nothing. Another theory, universally shared: The White House, led by people like UN Ambassador Susan Rice, was engaged in a massive cover-up. The first two theories remain defunct. A response team was sent to Benghazi; according to the State Department’s report, “the seven-person response team from Embassy Tripoli … arrived at the Annex about 0500 local. Less than fifteen minutes later, the Annex came under mortar and RPG attack, with five mortar rounds impacting close together in under 90 seconds.” Hicks doesn’t say that the CIA issued stand down orders, let alone twice. He says that a jet was never scrambled to fly over the city (which we knew) and that a second team, one that arrived too late, should have gotten there faster. And what he says is worth quoting at length—he’s the “A” in this conversation. Q: They didn’t miss the flight. They were told not to board the flight. A: They were told not to board the flight, so they missed it. So, anyway, and yeah. I still remember Colonel Gibson, he said, “I have never been so embarrassed in my life that a State Department officer has bigger balls than somebody in the military.” A nice compliment. Q: Now, at this point, are you having communications with Washington? A: I was in communications with Washington all night long. I was reporting all night long what was happening to Washington by telephone. Q: When these Special Forces folks were told essentially to stand down, what was your next move? Did you have a recourse? Were you able to call Washington? Were you able to call anyone at this point to get that decision reversed? A: No, because the flight was – the flight was leaving. And, you know, if they missed – you know, if the vehicles didn’t leave when they leave, they would miss the flight time at the airport. And the airport – you know, we were going all the way to Mitiga. The C-130 is at Mitiga, which is all the way on the other side of Tripoli. Q: What was the rationale that you were given that they couldn’t go, ultimately? The interviewer is doing just a little prodding here. It’s the interviewer, not Hicks, who first implies that the extra team was “told not to board the flight,” and the interview who says they were “told essentially to stand down.” But we already knew that the team didn’t get there; we were told, from the State report, that airborne surveillance was moved over Benghazi after the attack started, that a response team arrived right before the mortar attack, and that the team was there to evacuate Americans. What elevates this from a disagreement about tactics to a cover-up about a “stand down” order that night? Right now, it depends on whether you think State is lying or not. Correction, May 6, 2013: This post originally misspelled Sharyl Attkisson’s name.